From The Compound: What's with the Owls?? I Love OWLS. Have I always loved OWLS? No, I don't have the word OWLS on my vanity plates...some of you will know HOO I am referring too! I have never had a collection of owls placed all over my desk, mainly because I am just too lazy to remove all the empty Diet Mt. Dew cans. Owl Loving Reason #2-In January of 2006, Trevor's grandfather, Frank, was killed in a car accident. It was terrible. He was a great man. He was a carpenter, and had built our house two years before. During the house building process Owen and Grandpa Frank, or Big Worker Man as Owen called him, became really smitten with each other. I mean Owen and Grandpa Frank had always had a typical great grandpa/great grandson relationship, but the time they spent together during the building process took it to a whole new level. Frank was a unique man. He was about the most mild mannered, peaceful guy around. He would quietly sit and think while everyone else buzzed about. For example, during the Christmas shopping season, he would drive his wife Marilyn to Madison, grab a cup of coffee from Gloria Jeans and sit on a bench in the middle of the mall for hours. He'd get up if Marilyn brought back gifts to be delivered to the car, or if she wanted his opinion on a particular item, but otherwise he was planted on the bench. The crazy part is that he was completely content to sit there in the middle of the mall with nothing to do but think. I, for one, am happy he was thinking so much...it made him a brilliant carpenter. He was always coming up with new and creative ideas to make your dream home even more beautiful. Owen was a bright little kid with a huge vocabulary. He would come down to the house with us to see the progress being made. He would ask question after question and tell Grandpa Frank all about his latest experiences with bugs, snakes or whatever Owen was fixated on at the time. 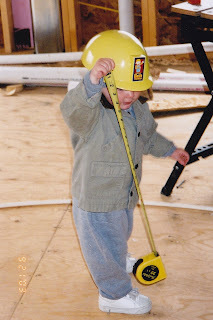 Many times he would wear his Bob the Builder hard hat and a tape measure so he could be a "Big Worker Man" like Grandpa Frank! So the months of banter between the two of them really solidified them as pals. The night after Frank's death, Trevor and I were trying to decide just how we were going to tell Owen about this terrible accident. We went to bed still unsure of what to say and how to answer the barrage of questions sure to follow the bad news. As I laid there crying, wishing this was the part of parenting that you could hand off to someone else and blame them if it goes horribly wrong or take credit for it if it all works out, I heard a sound outside. I knew what it was, but the volume of it and the unfamiliarity of it stopped my tears immediately. It was an owl hooting nearby. Now I had been living in this house for 2 years and I had never heard an owl hooting outside before...ever! And when I say nearby it must have been like hanging from the window because it was so loud - it was startling! It was definitely a sound I was supposed to hear that night. I woke Trevor and we listened to the owl for awhile and discussed how similar Grandpa Frank and that wise old owl were. Just like Grandpa Frank; all owls think a lot-to quote Owen's OWL BABIES book. We took this as a sign from Frank saying "I am fine and Owen will be fine." "Just tell him that I am here watching over him and this house I built. Everything is going to be OK." Eventually the hooting stopped and I slept peacefully. The next evening we told Owen the sad news and it was OK. He asked questions, and we tried our best to answer them. We all cried a little, but it was OK. We told Owen that Grandpa Frank was watching over all of us and that he would be protecting us. We told him that Grandpa Frank would be sending him I Love You messages from Heaven so to be on the look out for them. The next day, while we were dropping him off at Preschool, we found a nail laying in the parking lot. We all knew it was Grandpa Frank's first message to Owen. Other rusty nails, screws, Christmas lights and such do-dads have been the I Love You messages that followed, and we have a container of them to prove it!